One of the best explanations offered recently about the work of enterprise architects and their tools is by Tom Graves in his article titled Architecture as boxes, lines and glue. In it Tom rightly points out that much of the work of an enterprise architect is invisible (cohesively and logically connecting business functions), that the tools used and available today are ugly, and the sheer complexity in an enterprise of its various components in time, functions and other measures is so vast that the best metaphor to describe dealing with these is glue. In order to make the work of enterprise architecture visible yet not ugly and without creating diagrams of immense complexity, we need to understand that the tool must offers a way to create views, models and as well as the big picture to support ad-hoc analysis without much complexity. Architecture views or models only offers the partial glimpse of an enterprise reality because it lacks a sense of architecture continuum and hence can’t alone be used for all kind of analysis and pattern discovery. It misses the ‘Big Picture’. The views and models cover specific stakeholder’s work perspective because different views makes sense to different people. As long as its just a view addressing a particular stakeholder, the view provides a useful insight to the stakeholder but it does not represent the whole or big picture.On the other hand the ‘Big Picture’ could alone be not sufficient because it lacks the detail to generate insight. The ‘Big Picture’ must be able to offers an ability to drill down to any architecture layer or must be derived by connecting many views. 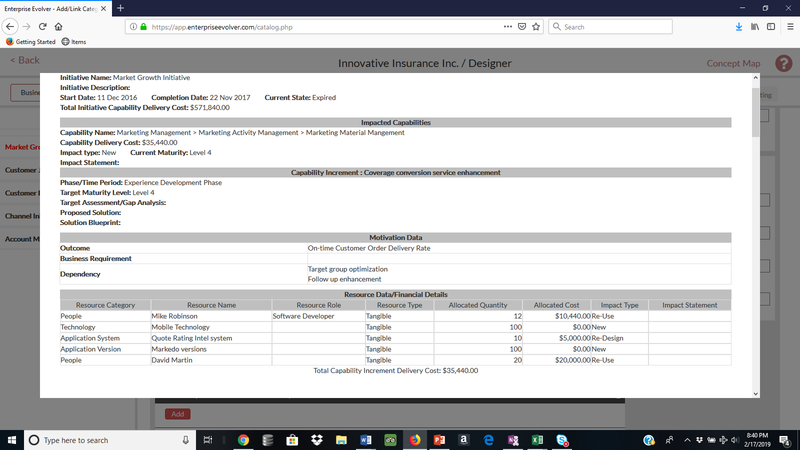 In Enterprise Evolver you creates views and models from stakeholder’s work perspective using the powerful Visual Editor. 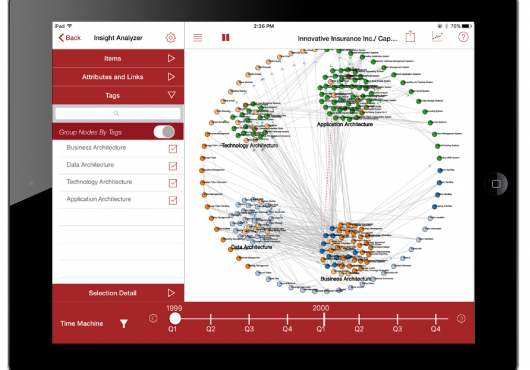 The Insight Analyzer module of Enterprise Evolver turns the underlying architecture data captured via the Visual Editor automatically into the Big Picture providing an overview that covers multiple architecture layers and provides an ability to uncover emergent patterns and to understand the cost of complexity. 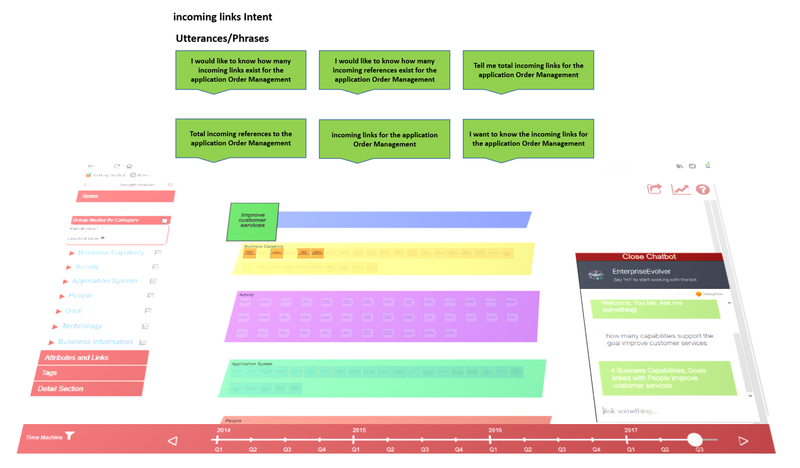 Most importantly, it generates dynamic views to support ad-hoc analysis. In Enterprise Evolver, while we do support many built-in architecture viewpoints (e.g, customer viewpoint, capability/strategy viewpoints, operational viewpoint etc) , our focus is on total visualization. we use network graph a visualization technique to illustrate the Big Picture. 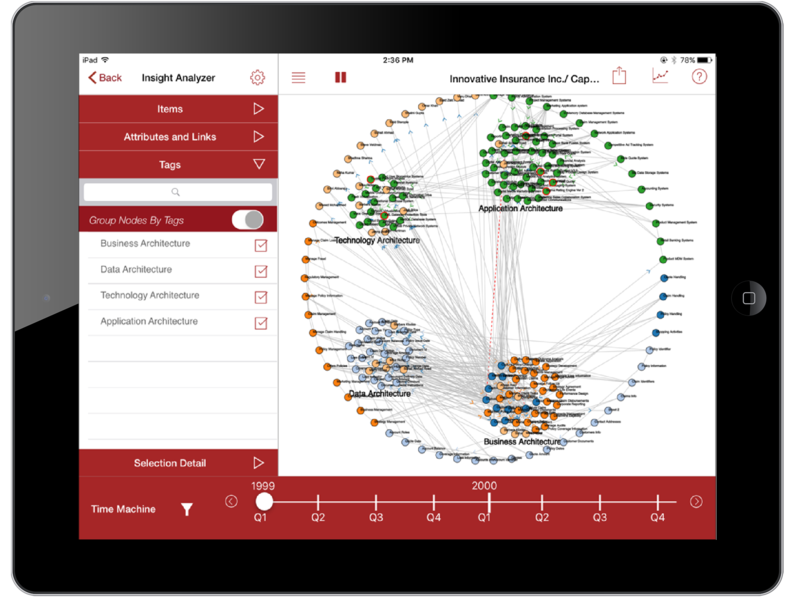 Enterprise Architects can use the Maps feature to create many views which then can be used for total visualization in a network graph. Our visualization techniques can be seen as the combination of graphical elements ( e.g. circles, squares, or lines), some visual attributes (e.g. color & size ), a set of supported interactive operations (e.g. physics simulation, filter and search and layout toggling) and connection and flow modeling to map the various architecture concepts (e.g strategy, capability, activity, systems, data, people and technology) to visualize enterprise evolution from multi dimensional data perspective. 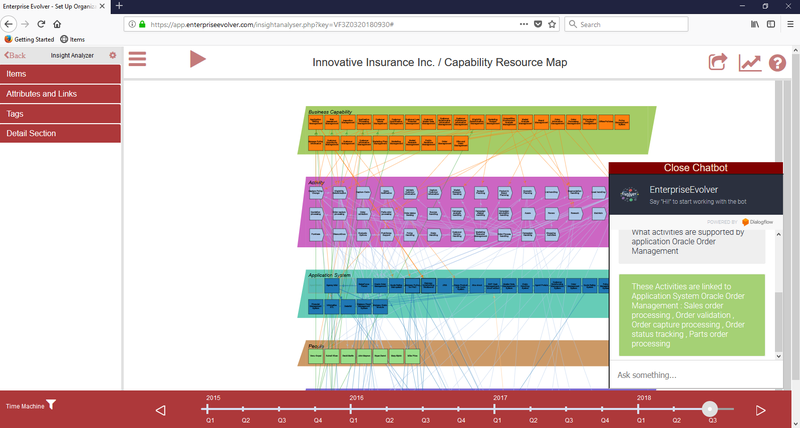 The version 3.0 of Enterprise Evolver with powerful time machine feature to visualize the evolution of your enterprise and the radial layout feature to identify the patterns and meanings in your architecture data will make you a smarter Enterprise/Business Architect. Watch this brief video to learn about the new features. You may also be interested in watching this video to learn how to create views and models using the Visual Editor. Simple and Easy solution for complex problem! Visit our website, http://www.enterpriseevolver.com to learn more and download the app today! For an enterprise license, contact us at this link. Download the app on your iPad from this link .